The car battery is a physics prop featured in Half-Life 2. It is used in an electricity puzzle during the chapter Sandtraps. During the chapter Sandtraps, five car batteries can be found in inconspicuous areas near an abandoned building and a gate made out of recycled materials. The building, a former Resistance base located between a Combine base and Lighthouse Point, is just off of a road blocked by an electric gate. The batteries require the use of the Gravity Gun to pry them out of awkward positions. One battery is already in its place; another one is on a bed; there is one on a tower; another one is in a blue car wreck; and one can be found under a bathtub. The aim of the puzzle is to collect enough batteries to send power to the gate so it will open and unblock the road. Car batteries also appear in the chapter Anticitizen One, scattered in a tunnel flooded by sewage waste, as well as inside the hood of the cars. Others can also be found later, scattered on the ground. View of the incomplete puzzle. The red lights indicate where a battery needs to be placed. View of the complete puzzle, with the previously red lights now green. 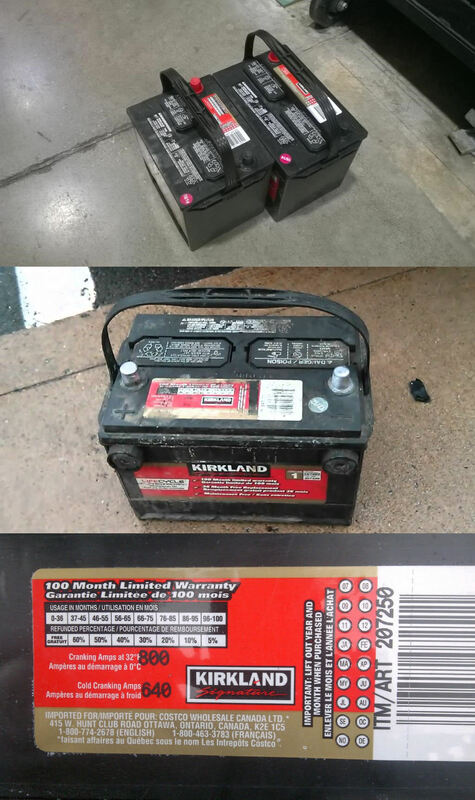 The sticker on top of the car battery appears to be taken directly from a battery sold at Costco warehouses as it bears the Kirkland Signature logo, which belongs to the company's private brand. Its name is derived from the former location of Costco's corporate headquarters, the city of Kirkland, Washington, in which Valve was based until 2003. This page was last modified on 11 November 2018, at 20:04.